The Great ShakeOut Earthquake Drill! Do you know what to do in the event of an earthquake? Have you practiced how to protect ourselves? 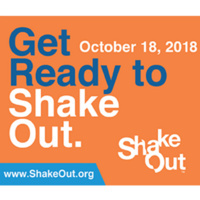 Come participate in the Great California ShakeOut Earthquake Drill on October 18, 2018 at 10:18 AM!